Designed to reduce obesity and removes unnecessary fat through bowel movement while facilitates burning of body fat. 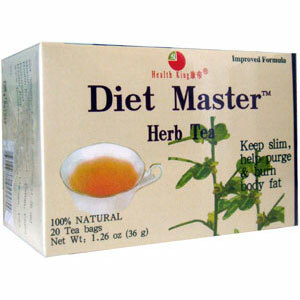 Diet Master Herb Tea is made of the well-known Chinese herb rhubarb (rhei rhizoma) with astragalus, both grown in the pollution-free primitive forest of northeast China. Naturally and nicely flavored, it is designed to reduce obesity. Rhubarb contains rhein, rheum emodin, glucoside, etc., and removes unnecessary fat through bowel movement while facilitates burning of body fat. Moisten and cleanse intestines and to facilitate easy bowel movement.